The Toyota Tacoma is a Japanese mid-sized pickup truck and is one of the best available used trucks nearby. The Tacoma is available and a popular pickup truck purchase around the world. First built and marketed as a compact sized pickup truck during its first generation run, the Tacoma is now only offered strictly as a mid-sized pickup truck. Manufactured since 1995, the Tacoma is still in production to this day. Toyota gave the Tacoma a front engine layout with either a rear or four-wheel drive propulsion option. As of today, the Tacoma has gone through three different generations and is currently in its third generation which started in 2015 and is still in production today. The Toyota Tacoma got its name from Coast Salish people who are from the Pacific Northwestern coast. “Tacoma” is their name for Mt. Rainier. The first generation of the Toyota Tacoma was produced from 1995, until the year 2004. The Tacoma was the Toyota motors company’s replacement for the Toyota Hilux model, otherwise known as the very generically named “Toyota Pickup.” The Hilux model pickup truck from Toyota was manufactured beginning in 1968 and is still sold around the globe. The Tacoma was designed from a great desire by Toyota to step-up on the ride quality, vehicle handling, comfort, safety, payload, and towing capacities compared to its predecessor. Toyota wanted to meet and exceed the needs of the Canadian and American auto consumers who bought this style of pickup trucks for personal use vehicles. The first generation Tacoma started being conceived and engineered in 1989 at Calty Design Research in California. Kevin Hunter designed the Tacoma’s exterior and the Patent was filed in the United States and Japan in 1993. Toyota offered three different powerplants for the original Tacoma. A 2.4 liter 4-cyclinder capable of 142 horsepower and 160 lb-ft of torque. A 2.7 liter 4-cyclinder capable of 150 horsepower and 177 lb-ft of torque, and a 3.4 liter 6-cylinder with a rating of 190 horsepower and 220 lb-ft of torque. A two-wheel drive version of the Tacoma was available in either automatic or manual transmission with the 2.4L and 3.4L engines offered. A TRD Supercharged Toyota Tacoma was offered with the 3.4L V6 putting out 254Bhp. Extended cab models featured a 6-foot bed while crew cab models received a 5 foot 5-inch long bed. The year 2000 brought cosmetic upgrades as well as an optional S-Runner trim level, which received the 3.4 L V6 motor. A 5-speed manual transmission, Tokico gas shocks, and 16-inch wheels added to the upgrades of this trim level. By the end of the first generation’s run in the year 2004, the Tacoma was second in sales to only the Ford Ranger in the respected compact truck class. Toyota recalled about 800,000 first gen Tacomas in the year 2008. Vehicles were from the model years 1995-2000 and Toyota either bought back the truck or replaced the frames due to poor rustproofing, which was causing the frames to corrode. A separate recall included about 150,000 Tacomas from the model year 2001 to 2004 and was issued for reasons involving a spare tire, targeted at cold-climate US states. The second generation of the Toyota Tacoma ran from the model year 2005 until 2015 and was developed starting in the year 2000. Early 2004 brought the introduction of a newer and bigger Tacoma at the Chicago Auto Show in February. The larger more powerful Tacoma was available in an astonishing 18 different configurations involving three different cab sizes, two engines, four transmissions, and a set of two different bed lengths. Toyota went well out of their way to provide a Tacoma pickup truck option available to just about every consumer who wanted a small to medium-sized pickup truck. 4 or 5-speed automatics and 5 or 6-speed manual transmissions were offered along with a new 4.0L V6 to replace the 3.4L and the daintier brand new 2.7L 4-cylinder for lower priced Tacomas. The new V6b produced 236 horsepower and a 6,500-pound towing capacity, while the new 2.7L 4-cylinder received 159 horsepower and 180 lb-ft of torque. The X-Runner trim was available in place of the low-popularity S-Runner trim level. The new 4.0L V6 was matched up with the six-speed manual transmission with an optional TRD Off-road package. Any TRD trucks got additional Downhill assist control, which adds automatic braking during hill declines while the HAC keeps the vehicle from rolling down a hill backward. All TRDs also have a locking rear differential. The X-Runner has an X-Brace suspension package and 18-inch wheels. Running from 2016 to the present, the latest generation of the Toyota Tacoma has a redesigned exterior, much of which was borrowed from the 2014 4Runner and Tundra. Projector beam headlights, a rear spoiler, and a front air dam were all added to the newer, bigger Tacoma. The 2.7L 159 horsepower -cylinder was matched to either a 6-speed automatic or a 5-speed manual. The larger 3.5L V6 putting out 278 horsepower and 265 lb-ft of torque is paired to either a 6-speed manual or automatic transmission option. The additional tow package gives the Tacoma a tow rating up to 6,800 pounds now. Toyota built the body and frame with high strength steel and a new stamping process to reduce weight, yet add strength and rigidness. Six trims are now offered in the present Tacoma ranging from base SR, mid-level SR5, TRD Off-Road, TRD Sport, Limited, and the TRD Pro. Two different cabs are now offered instead of the previous three, ditching the regular cab model. A completely redesigned interior gives the Tacoma a larger touchscreen display, new instrument readout panel, and a luxury class feel, with leather now offered as an option. Sales of the Toyota Tacoma have generally increased year after year with a few exceptions, bringing the current Toyota Tacoma 2016 sales up and over 191,000 units in the United States alone. A Tacoma is absolutely a great option when looking for a used truck near you. They are plenty affordable, and offer a great resale value. The Toyota Tacoma is a great used truck, without a doubt. In February of 2019, the highly-anticipated unveiling of the Tacoma’s update for the 2020 model year took place just before the Chicago Auto Show. Following the release of a teaser photo, framing the new Tacoma’s silhouette enigmatically against the backdrop of a desert sunset, questions arose regarding the extent of the update. And while it might best be described as ‘mild’, it seems to embrace an ‘if it ain’t broke, don’t fix it’ mentality. In 2018, the Tacoma enjoyed increased sales of up to 24%, topping the combined numbers earned by the GM’s twinned Colorado and Canyon. At 245,000 units sold, the Tacoma had experienced a banner year, reiterating the reason why it so easily de-throned the last-gen Ranger fourteen years ago. And while the aforementioned Ranger has returned, we’ll save any discussion of comparison to another day. Our point is, there wasn’t a lot of need to reimagine the Tacoma – simply to identify strengths and weaknesses, and act accordingly. In terms of visual changes, it’s a fairly short list. Updated grilles and wheel designs count among the most obvious across trim levels, while darkened light housings, LED and chrome accents help to pull the overall aesthetic together. Inside the cabin, one might appreciate more thoughtful material choices and the inclusion of power seats. What didn’t change was the engine. Carrying over the options of a naturally aspirated 2.7-liter four-cylinder, or 3.5-liter V6, the Tacoma can wrangle 159 hp and 180 lb-ft of torque, or 278 hp and 265 lb-ft respectively. Either engine can be paired with the standard 6-speed automatic transmission, with the latter eligible for a 6-speed manual. And the off-road designed TRD Pro gains upgraded tires and suspension, reflective of a weight reduction from the previous model year offering. But technology seems to be at the heart of the update, including a 7 -or- 8-inch touchscreen interface to a new infotainment interface. And included in the new system is compatibility with not only Android Auto and Apple CarPlay, but Amazon Alexa as well. This increased connectivity with one’s home-based system can be viewed as a positive, or a negative, depending on your level of appreciation for Alexa. That said, it feels like a timely inclusion. And for off-roading enthusiasts who might find their way behind the wheel of a TRD, the availability of the Multi-Terrain monitor and new 360-degree camera system proves useful in improving overall visibility and, in turn, safety. And speaking of Safety, the highly-celebrated Toyota Safety Sense Suite only serves to enhance most every vehicle in the lineup. 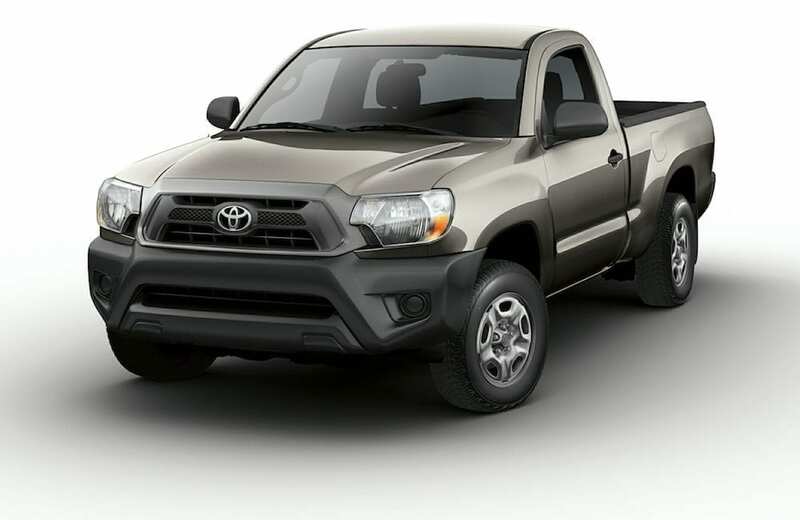 In fact, the Tacoma comes standard with Safety Sense-P which includes (i) adaptive cruise control (ii) forward collision warning (iii) automatic braking (iv) lane departure warning, and (v) automatic high beams as standard equipment. All in all, Toyota has delivered a thoughtful offering in the form of the 2020 Tacoma, proving that it isn’t change for the sake of change. But now that we’ve given you a 10,000 ft look at the Tacoma’s lifespan to-date, what if you’re leaning towards an earlier model year offering. Well, even if you were looking to jump back a few model years, Toyota has given you lots of reasons to be happy with your decision. When it comes to discussion of the Tacoma’s second and third-gen offerings, one would be hard-pressed to argue an absence of incentives to buy pre-owned. But that perception of value has to do with more than the Tacoma’s features and specifications. The simple truth is that the decision to buy pre-owned is arguably more prudent if your goal is to get more truck for your money. Back in 2015, a brand-new 4WD Tacoma would have run you somewhere around $26,000. And while that certainly emphasizes the accessibility of the Tacoma’s price point, the influence of depreciation starts to paint an entirely different picture. We’ve all heard the anecdote about how vehicles lose value as soon as they’re driven off the dealer’s lot. And while there are certain protections built in to protect the consumer’s best interests, the truth is that depreciation is very real (and occurs very suddenly). In fact, were those protections not in place, a dealership might benefit from the fact that your new Tacoma would lose up to 11% of its value the moment its front tires hit public streets. In other words, you could turn right around, pull into the dealership and they might only offer you $22,500 on a trade-in. Needless to say, it’s a good thing that there are laws that prevent this. But the steady decline in value of a vehicle doesn’t end there. As one would expect depreciation grows exponentially across a vehicle’s years of ownership. A year later, that vehicle’s value might have experienced a decrease of up to 25%. This means that your $25,000 vehicle might only be worth $18,750 within ten months. Flash forward to the three-year mark, and a 46% decrease in value places it at $13,500. At five years, it might only be valued at $9,250. But if we’re talking about buying a new truck in 2015, what does this have to do with your decision to buy used trucks nearby in 2019 or beyond? As mentioned above, it comes down to your ability to get more truck for your money. The relative lack of changes made in third-gen offerings, for an example, make a 2015 Tacoma largely indifferent from a 2018. Taking that into consideration, you’re able to negotiate the purchase of a comparable truck for significantly less. The asking price of a 2015 will have been influenced by depreciation and, while the dealership’s need to profit will prevent you from getting it ‘at value’ you could easily end up paying half to two-thirds the original price. Why wouldn’t you feel good about that? For some buyers, a hesitance to buy a pre-owned vehicle comes from a perceived lack of assurance. And while not all pre-owned vehicles will qualify (or be offered by a qualified dealer) the option of a certified Toyota might help to address any hesitation. The Toyota Certified Advantage delivers qualified pre-owned vehicles that have passed a rigorous 160-point inspection to ensure that they meet manufacturer standards. Any parts or major operating systems that fail to meet said standards, will be refurbished, repaired or replaced (as needed) by Toyota certified technicans, using Toyota certified parts. And in addition to assurance, TCA customers enjoy a 12-month / 12,000-mile Limited Comprehensive Warranty, and a 7-year / 100,000-mile Limited Powertrain Warranty. Combined with 1-year of Roadside Assistance, there are plenty of reasons to consider a certified pre-owned Toyota. Earning high marks from countless consumer resources, including Kelley Blue Book, the Tacoma has been recognized for its ‘Best Resale Value’ and ranks among the top choices for reliability, quality, performance, styling and comfort. Why choose a Tacoma? If you’re interested in a mid-size pickup, you might want to ask yourself ‘why not’?